As I write this post and recipe, I’m admiring the lights of my Christmas tree, a cinnamon candle is lit, and the dog is, of course, fast asleep next to me on the couch. I love December! This time of year brings out the most abundant and festive fruits into the markets. Blood oranges, pomegranates, apples, and of course cranberries. I love cranberries for their tartness and after seeing piles of them in markets around Thanksgiving, I was inspired to create a recipe that showcased their goodness and the warm flavors of the season. 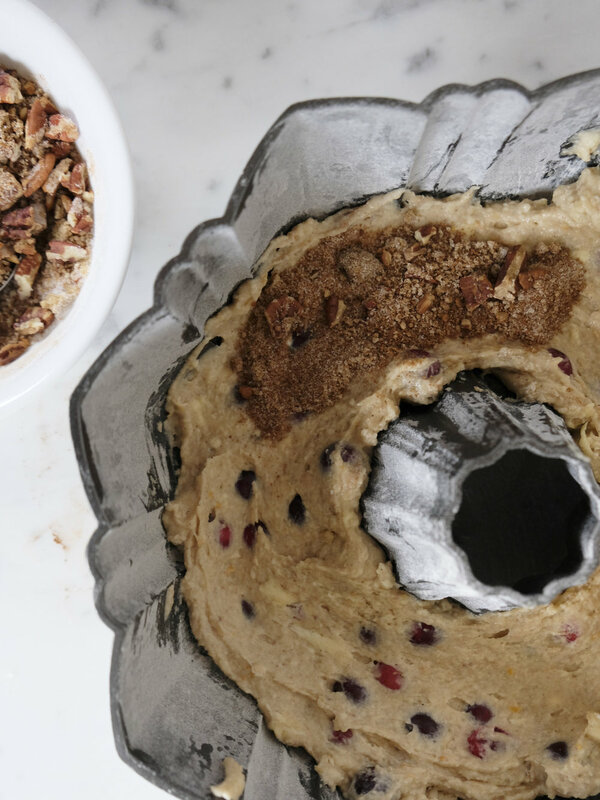 The highlight of this bundt cake is the five spice powder. The five spice powder gives the cake a spicy undertone and with orange juice and zest helps to balance and temper the tartness of the berries. This cake would be a perfect addition to a weekend holiday brunch or as a snack at your office holiday party (as it was for mine). I love the hustle of December, when calendars book up quick, parties seem to be every night, everyone is bundled up in scarves and gloves, and it seems like I’m baking nonstop. It’s so magical! Fingers crossed Seattle gets some decent snow this winter (though we Seattleites do not understand snow and the city basically shuts down when even half an inch of snow falls). After making this cake, you and your home will be all ready for the holidays and the barrage of unexpected guests this month always brings. This cake has a great spicy taste that is brought out by the orange juice and zest and the five spice powder. Unless you frequently cook Asian foods, buy five spice powder in a small quantity from your supermarket bulk aisle or a spice shop. The sugared cranberries are optional and can be made with whatever quantity of cranberries you have left. Make batter: in a bowl, whisk dry ingredients together: two cups of flour, baking soda, baking powder, sea salt, orange zest, five spice powder, nutmeg, and cinnamon. In a small bowl mix cinnamon sugar ingredients. In a separate bowl, sprinkle 1 tablespoon flour with cranberries, set both bowls aside. In a large mixing bowl or the bowl of a stand mixer, cream butter on medium for a few minutes until fluffy. Add in sugar and mix on medium for a few more minutes until mixed, scrape bowl with spatula if necessary. With mixer on low, add in eggs one at a time until well incorporated, then add orange juice and vanilla, mix slowly until blended. Slowly pour flour mixture into egg mixture in a few additions, mix batter until no flour remains. Assemble cake: well grease and flour a 12 cup bundt pan. Pour half of the batter into the pan. Using a spoon, smooth out the batter and make a small well in the center of the batter. Carefully spread most of the cinnamon sugar filling in the well avoiding the sides of the pan. Pour the rest of the batter over the filling and smooth with a spatula. Sprinkle remaining sugar. Bake for 40-50 minutes. Remove from oven and transfer to a wire rack to cool. Cool in pan for 10 minutes before inverting. 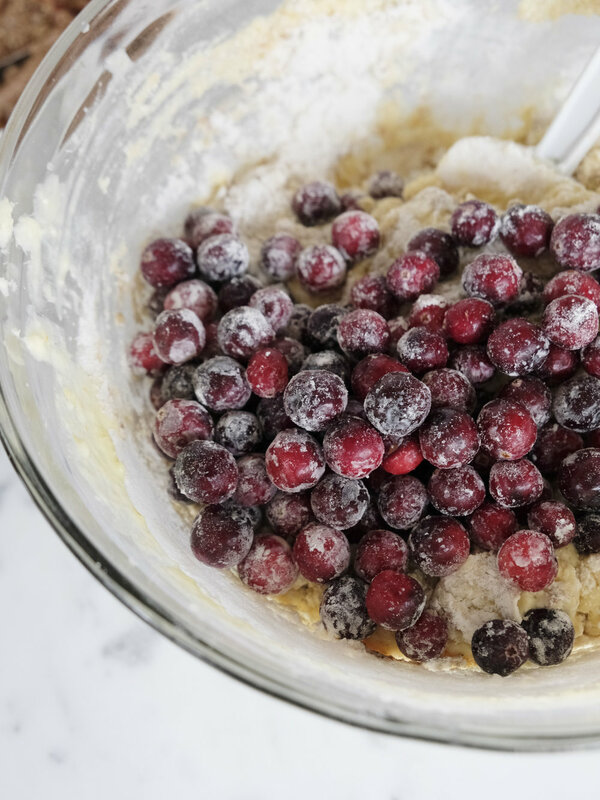 While cake is baking, make sugared cranberries. In a small saucepan combine 1/2 cup sugar and water and heat over medium heat until mixture starts boiling. Stir in cranberries until well coated, then remove with a slotted spoon to a wire rack until dry, about an hour. In a shallow bowl or rimmed baking sheet, spread remaining cup of sugar. Roll cranberries in sugar and let dry again, add more sugar if necessary. Garnish cake with powdered sugar and sugared cranberries.